Hey, my name is Kim - Remember me? It's been a while. Okay, it's only been six days, but it seems like forrrr.eeeev.errrr (Sandlot style). Gah, Kim, why did you abandon the blogosphere for six days?!?! I've just been super duper busy with work and marathon training and all of that fun stuff! But enough of that. 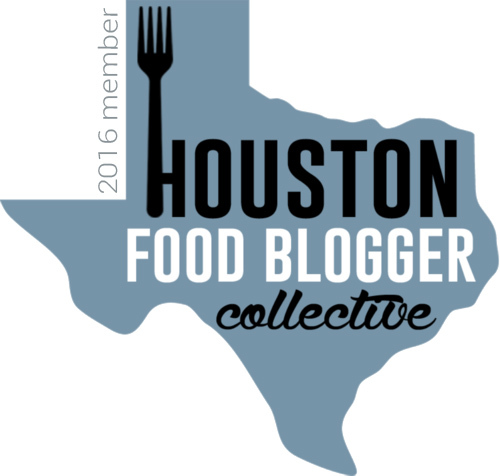 Onto the H-Town eats! 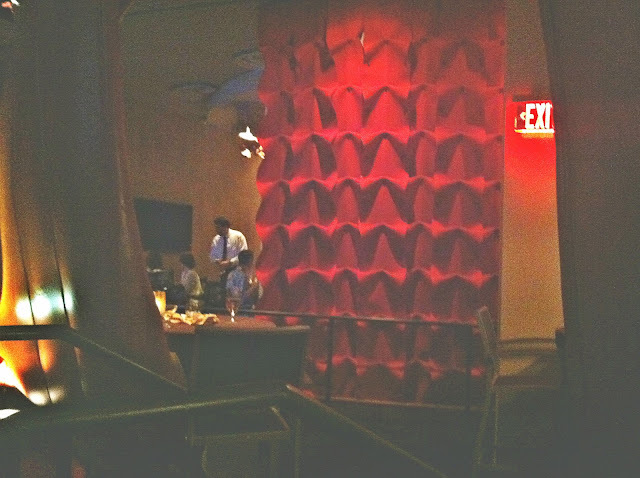 As some of you may or may not recall, I'd rolled the proverbial Houston Restaurant Weeks die recently and had two lackluster experiences at Hearsay Gastro Lounge and Brennan's. Needless to say, I was very hesitant upon going to my final HRW stop last weekend, Américas in River Oaks. But boy, was I in for a treat. First of all, I loved the inside of Américas. My first thought when we walked in was, "This restaurant looks like it came straight from Las Vegas." Not because it has magicians, slot machines, and guys in every corner handing you disturbing postcards. But because it's super funky, colorful, and seriously cool. You know, like Vegas. So we got to our table, and our waiter was beyond pleasant, attentive, laid back, and did not rush - or, conversely, neglect - us at all. Very refreshing! 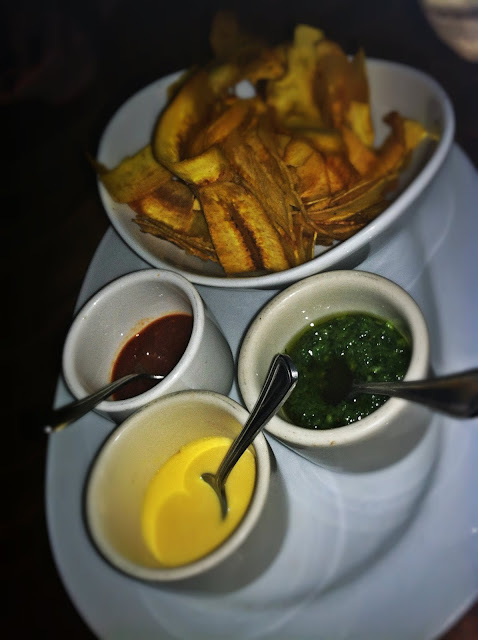 So before we got our courses, we were given a delicious starter of fried plantains with three different sauces - A buttery sauce, a pesto-y sauce, and a spicy sauce. And man, was it all good. The plantains were not too crispy, not at all soggy, and did not have an overwhelming banana taste (Yes, I realize plantains are different from bananas, I did live in Miami for four years). They were awesome. For my appetizer I got the Angel Wings, which might have been the cutest little suckers I've ever seen. On top of that, they were juicy and light, and they tasted heavenly (I guess that's why they call 'em "Angel Wings") dipped in the blue cheese that came on the side. 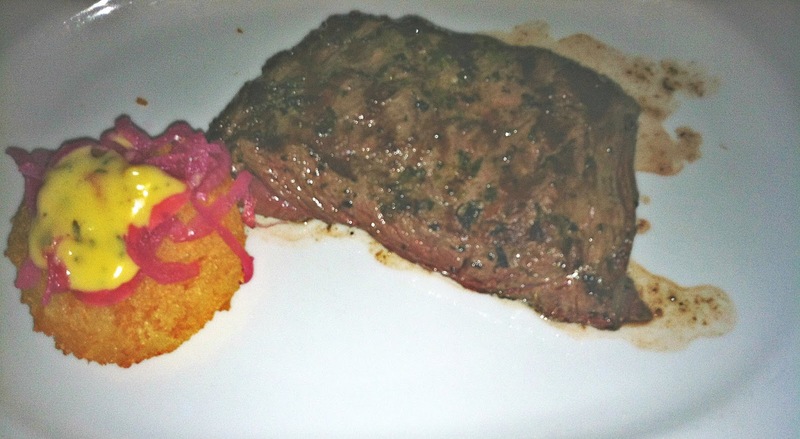 My boyfriend Jason and I both got the Churrasco Steak, which has been rated by Esquire Magazine as one of the Top 20 Steaks in America. And I have to say, were they right. 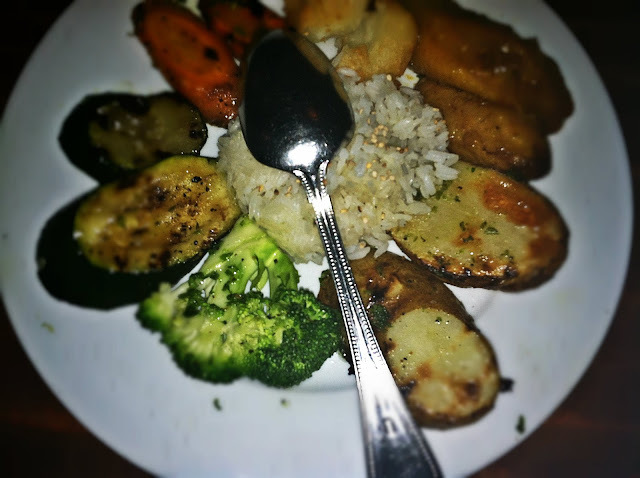 The steak was so tender it could be cut with a butter knife. A butter knife! Eating that steak was seriously an otherworldly experience. And the Yukon Cake (aka big fancy tater tot) and mixed veggies that came with it were equally as wonderful and complimented the steak perfectly. For our desserts, Jason and I split the Tres Leches and Delirio De Chocolate. We couldn't finish either one of them because they were both so huge, but they were utterly delectable. 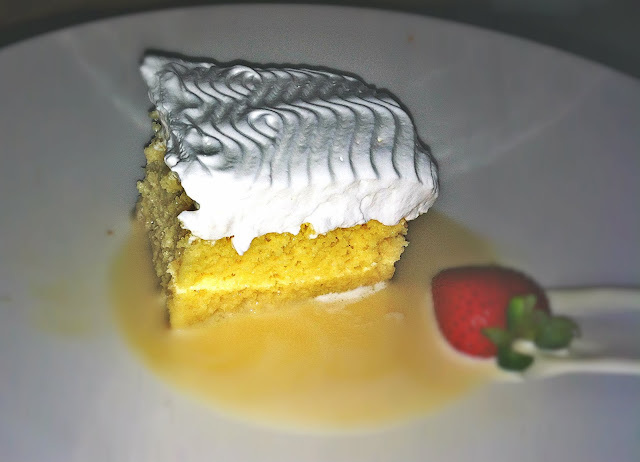 The Tres Leches won the popular vote - It was moist, silky, light, and simply breathtaking. 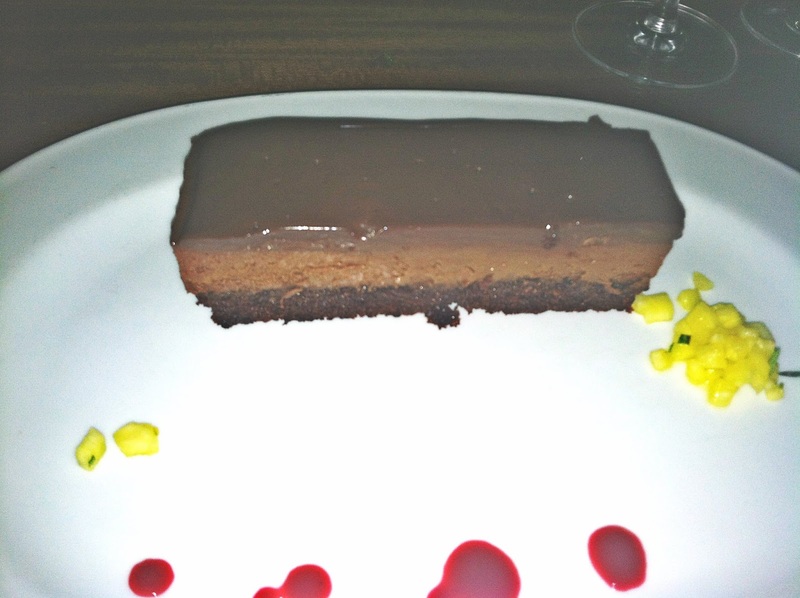 The Delirio De Chocolate (big chocolate cake) was also very good, but it was SUPER chocolate-y and super rich. It is one of those decadent desserts that deserves three solid, drawn out savoring bites. I definitely recommend going there to celebrate a special occasion, to sit outside on the deck during Happy Hour, to take in the scene of well-dressed swanky patrons, or to just have a wonderful night out. Also, get the mojito. #YOLO (Yes, I absolutely just hashtag/yolo'ed).